What started out as another split ring variation by Maggie Maggio became a “Slinky” polymer bracelet as we worked side by side on vacation. It began as a snake covered with a Skinner blend and was rolled out to four feet in length before it was pinched flat. The other cool variations that Maggie came up with aren’t ready for prime time yet but you can check her site to follow her progress. She’s teaching a polymer watercolor landscapes class in June if you’re in the Northwest. Have a grand weekend. I’m off to Virginia…another polymer-rich environment that will surely contain interesting material for next week’s posts. That is a very cool bracelet that brings up a question that I wonder and wonder about (and experiment with)…how much movement with polymer clay tolerate? Have a great weekend – I am headed to Virginia too! I am trying to wrap up my polymer clay obsession and focus on the garden for a while. I do wish you’d quit showing me these fantastic and inspirational great ideas, okay? Of course, I am joking! You’ve given me one more thing to explore and I am so grateful! Thanks so much! Wow, that is one inexcusably fabulous bracelet. Bravo! Like Genevieve, I also wonder and wonder about polymer clay. I think the clay tolerates a lot as long as it is cured correctly, but I’m wondering if the bracelet stays snug? I would be tempted to wrap it around memory wire … has anyone done that with a design like this? How neat–I know what my daughter and I will be making at clay camp next weekend! If conditioned, baked and used properly, polymer clay can be very strong. Each brand has distinct characteristics and appropriate uses. 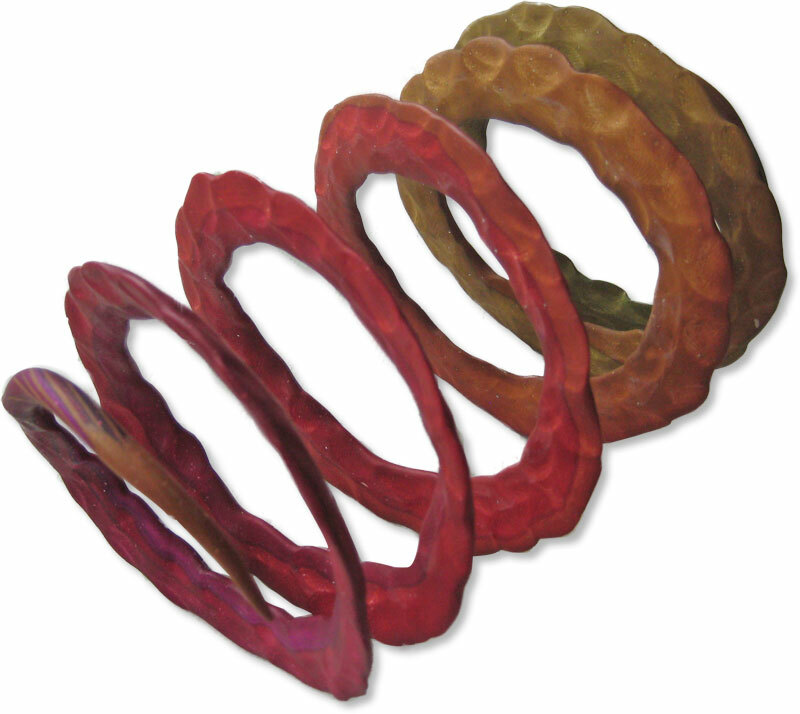 This bracelet design was tested using a few different clays. The Premo version passed all the strength tests so it went on to the comfort and durability tests – wearing it for a full day, including to bed overnight (with lots of tossing and turning!) and taking it on and off thirty times. It is very light and comfortable and it has not yet unwound. So far so good – but the experiments continue. wonderful! such a tactile piece. What an ingenious idea! Bravo! Hats off to Maggie for pushing the envelope and pioneering new possibilities with the clay in this way. Your work is very exciting and helpful! I love the way you experiment, test, and inform–it saves some of us months of work. 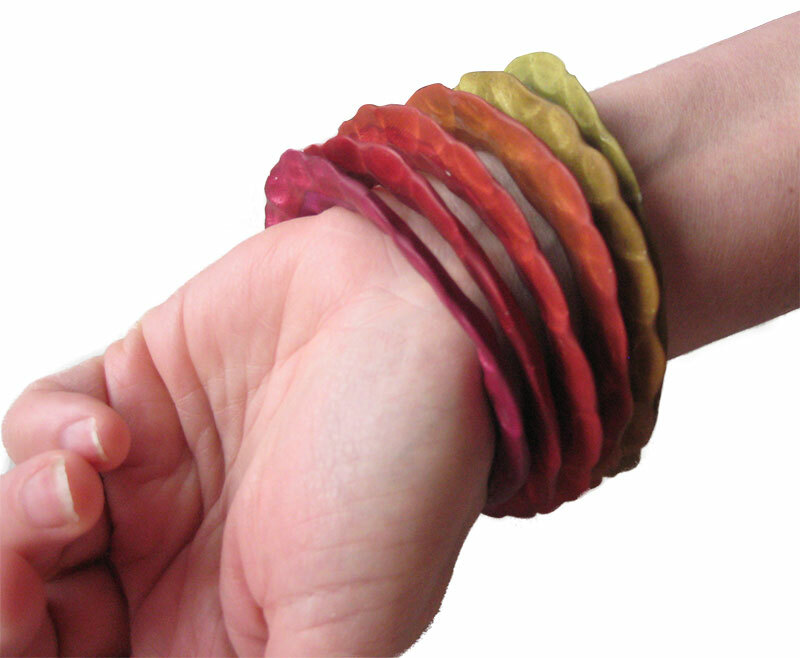 I think we are constantly underestimating the tensile strength of polymer clay–even experienced clayers are always asking me what core I use for my bangles, and are shocked when I tell them it’s all polymer–no additives, no fillers; after all, when you consider the strength and durability of the pvc pipes in your home–chemically the same as polymer clay–it gives one the courage to push the envelope. Bravo on this example, both of you!